Intrahepatic cholangiocarcinoma, Multivariate analysis, Perineural invasion, Lymph node metastasis. Intrahepatic Cholangiocarcinoma (ICC) is a kind of malignant tumor develops in either left hepatic ducts or large intrahepatic ducts . As the second most common cancer in liver tissue, ICC only accounts for 15% of all cases of liver cancer [2,3]. However, ICC causes unacceptable high morbidity and mortality rates because it is symptomatic during the early stage and most of the patients with ICC were diagnosed in advanced stages . Although a variety of treatments have been developed to treat ICC, most of them failed to provide satisfactory treatment outcomes. Radiofrequency ablation has been widely used in the treatment, however, a recent study showed that radiofrequency ablation can only be used to treat primary tumors with a small (<3 cm) or intermediate (3-5 cm) diameter, while treatment of unresectable primary tumor only result in a median overall survival time . Up to now, surgical resection is the method that can cure ICC, however, most of the patients were found to be not suitable for surgical operation by the time of diagnosis . The development of ICC is usually accompanied by the occurrence of lymph node metastases, and the number of lymph node metastases has been proved to be closely correlated with the prognosis of patients with ICC . However, current methods used to predict lymph node metastases usually yield unsatisfactory outcomes . Therefore, the accurate prediction of lymph node metastases will definitely improve the treatment and prognosis of patients with ICC. Imaging techniques have been widely used is the diagnosis of ICC [7,8]. A recent study showed that the vascularity of ICC detect by CT was closely correlated with various prognostic factors including the incidence of lymph node metastases , indicating the promising application values of CT in predicting lymph node metastases from ICC. In addition, the development of ICC is accompanied by the changes in expression of related genes, resulting in changes in contents of various physiological and biochemical indicators [10-12]. Therefore, it will be reasonable to hypothesize that the use of CT scanning results combined with physiological and biochemical changes may possibly achieve a better prediction for lymph node metastases from ICC compared with CT alone. In this study, ICC patients with or without lymph node metastases were included to analyse the factors related to lymph node metastases. The report is as follows. Clinical and pathological data were collected from 81 patients with intrahepatic cholangiocarcinoma who received surgical resection in our hospital from June 2006 to October 2016. All patients were confirmed with intrahepatic cholangiocarcinoma through pathological examinations. There were 50 males and 31 females. Ages ranged from 35 to 82 y with an average age of 61.6 y. All patients signed informed consent. This study was approved by the ethics committee of our hospital. CT characteristics can provide useful information for the diagnosis of various diseases. Therefore, all patients were subjected to CT scanning in this study. CT was performed using Aquilion ONE 320-Detector CT scanner (Toshiba, Japan). Scanning parameters: 1 mm slice thickness, rotation time 0.5 s, tube voltage 135 kv and tube current 350-400 mA. Enhanced scanning was performed by injection of 150 ml iopamidol (350 mgI/ml) at a speed of 4 ml/s using a high pressure syringe. Arterial phase scanning was performed at 27 s after the injection of contrast agent, portal-vein phase scanning was performed at 65 s after injection, and delayed phase scanning was performed at 3-5 min after injection. Hounsfield Unit (HU) of both tumor area and normal liver parenchyma was measured. Hepatitis B surface antigen (HBsAg), Alpha-Fetoprotein (AFP), serum carbohydrate antigen 19-9 (CA-19-9), Carcinoembryonic Antigen (CEA), number of primary tumors, tumor diameter, vascular invasion and other indicators were detected. Patients were divided into lymph node metastases positive and negative based on pathological examination. Statistical analysis was performed using SPSS20.0 statistical software. Univariate analysis was performed by chi-square analysis, and factors with statistical significance in univariate analysis (p<0.05) were subjected to multivariate logistic analysis. All analytical data were expressed as mean ± SD, and p<0.05 was considered to be statistically significant. ROC curve analysis was performed to evaluate the predictive values of each index for lymph node metastases from ICC. As shown in Figure 1, mass lesions were observed (arrows) in a 44 y old man with cholangiocarcinoma. Wash-in and fade-out dynamic enhancement patterns were observed. Plain CT showed hypointensity lesions or multiple hypointensity lesions. Moderate enhancement was observed during arterial-phase and further enhancement was observed during portal-vein phase, but density is still lower than the surrounding liver parenchyma. Stronger enhancement was observed during delayed-phase. Figure 1: Typical images of cholangiocarcinoma. Lymph node metastasis was found in 26 patients including 15 males and 11 females. Lymph node metastasis was not observed in 55 patients including 35 males and 20 females. Among patients with lymph node metastasis, 14 cases were younger than 70 y and 12 cases were older than 70 y. Among patients without lymph node metastasis, 37 cases were younger than 70 y and 18 cases were older than 70 y. No significant differences in gender and age were found between those two groups. Univariate analysis showed that HBsAg, CA-19-9, number of primary tumors, tumor diameter, ratio of long-to-short axis diameter and perineural invasion was significantly correlated with lymph node metastasis (p<0.05) (Table 1). Those factors were further subjected to multivariate analysis. Results showed that only tumor diameter and CA-19-9 (95% confident interval: 1.834~4.675) was significantly correlated with lymph node metastasis. Table 1. Univariate analysis of factors correlated with lymph node metastases in patients with intrahepatic cholangiocarcinoma. As shown in Table 2, the sensitivity, specificity, positive predictive value, negative predictive value and accuracy of CT combined with CA-19-9 were also higher than those of CT and CA-19-9 alone. CT alone was the worst among those three methods. For example, sensitivity of CT alone was only 34.62%, which was much lower than that of CA-19-9 alone (84.62%), while CT combined with CA-19-9 achieved a sensitivity of 88.46%, which was higher than that of CA-19-9 alone. Table 2. Comparison of CT, CA-19-9, and CT combined with CA-19-9 in prediction of lymph node metastases. 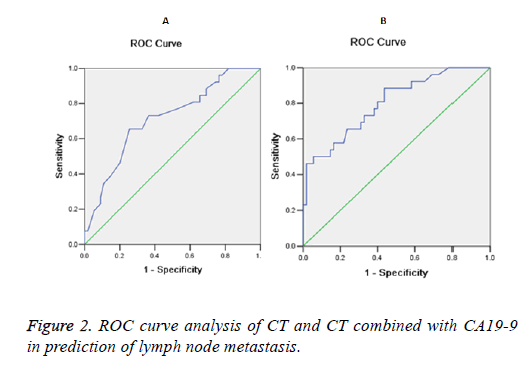 ROC curve analysis showed that Area under the Curve (AUC) of CA19-9 is below 0.5 in the diagnosis of lymph node metastasis (data not shown), indicating that CA19-9 itself is not enough for accurate prediction of lymph node metastasis. AUC of CT is 0.714, suggesting that CT can successfully predict lymph node metastasis to a certain extent. AUC of CT combined CA19-9 was 0.799, which was greater than of CA19-9 and CT alone. Therefore, CT combined with CA19-9 can achieve better prediction outcomes of lymph node metastasis compared with CA19-9 and CT alone (Figure 2). Figure 2: ROC curve analysis of CT and CT combined with CA19-9 in prediction of lymph node metastasis. Lymph node metastases are common in patients with ICC and the number of lymph node metastases seriously affects treatment outcomes . A study carried out by Mechteld et al. has shown that the median survival time of ICC patients with lymph node metastases is significantly shorter than that of the patients without lymph node metastases, while tumor size showed no significant effects on overall survival . Although surgical treatment is a promising method in treatment of ICC, surgery alone failed to prolong the survival time of patients with the existing of both ICC and lymph node metastases . Lymph node metastases are common types of metastases for various cancers. Although various methods and programs have been developed for the diagnosis of lymph node metastases in patients with different cancers, most of the methods failed to provide satisfactory prediction . Diagnosis of lymph node metastases in patients with breast cancer using sonography can only reach fair specificity and moderate sensitivity . Although biopsy guided by sonography can sometimes increase the specificity, this method is still challenged by the unsatisfied sensitivity . In the study of prostate cancer with lymph node metastases, Mukesh et al reported that MRI combined with the application of lymphotropic super paramagnetic nanoparticles significantly improved the detection of distant lymph nodes metastases in humans . CT and magnetic resonance imaging (MRI) have been proved to be inaccurate in the diagnosis of lymph node metastases in endometrial and cervical cancer patients, but the combined use of imaging technique and a specific contrast agent for lymph node which contains ultra-small particles of iron oxide has been proved to significantly increase sensitivity without affecting specificity , indicating that imaging technique combined with other method may potentially improve the detection of lymph node metastases. CT scanning has been proved to be a potential tool for the prediction of lymph node metastasis in patients with ICC. Yamamoto et al. reported that vascularity of ICC obtain form the analysis of CT scanning results was closely correlated with a variety of important prognostic factors and pathological processes including perineural invasion and lymph node metastasis , indicating the potential application value of CT in prediction of lymph node metastasis. In another study, the application of CT, MRI and Fluorodeoxyglucose Positron Emission Tomography (FDG-PET) in prediction of lymph node metastasis in patients with ICC were compared . This study showed that the accuracy and specificity of CT were 68% and 76%, respectively, which were significantly lower than those of FDG-PET but higher than those of MRI, and all those three imaging techniques only achieved a low sensitivity of 43% . In our study, the accuracy, specificity and sensitivity of CT were only 35.80%, 36.36% and 34.62%, which were even lower than those reported in previously studies. Results in this study and previous studies suggest that CT alone is not sufficient for the effective and accurate prediction of lymph node metastasis in patients with ICC. As a tumor marker, CA-19-9 has been widely used in the diagnosis of various human cancers. A previous study has showed that the used of CA-19-9 value>100 U/ml in diagnosing cholangiocarcinoma only achieved a sensitivity of 53%, indicating that measurement of CA-19-9 content is only a useful addition for other methods in diagnosis of cholangiocarcinoma . However, high serum levels of CA-19-9 were proved to be closely correlated with the development and recurrence of ICC . In our study, CA-19-9 content was used to predict lymph node metastases in patients with ICC. Compared with CT scanning, prediction with CA-19-9 content achieved much higher sensitivity, specificity and accuracy, indicating the application values of CA-19-9 content in predicting lymph node metastases. In addition, CT combined with CA-19-9 achieved much higher sensitivity, specificity and accuracy as well as bigger AUC compared with the application of CT and CA-19-9 alone. Those results suggest that CT combined with CA-19-9 can significantly improve the prediction of lymph node metastases in patients with ICC. In summary, tumor diameter and CA-19-9 content are closely correlated with the occurrence of lymph node metastases in ICC. CT combined with CA-19-9 achieved better prediction that CT and CA-19-9 alone. However, our study is limited by the small sample size, so further studied with bigger sample size are needed to validate our conclusions. In addition, more CT characteristics and more clinical features will be involved in our future studies to further improve the prediction of lymph node metastasis from ICC. Research project on education and teaching reform of Fujian Medical University No: J17016. Hennedige TP, Neo WT, Venkatesh SK. Imaging of malignancies of the biliary tract-an update. Cancer Imag 2014; 14: 14. Lafaro KJ, Cosgrove D, Geschwind JFH. Multidisciplinary care of patients with intrahepatic cholangiocarcinoma: updates in management. Gastroenterol Res Pract 2015; 2015. Bridgewater J, Galle PR, Khan SA. Guidelines for the diagnosis and management of intrahepatic cholangiocarcinoma. J Hepatol 2014; 60: 1268-1289. Cho SY, Park SJ, Kim SH. Survival analysis of intrahepatic cholangiocarcinoma after resection. Ann Surg Oncol 2010; 17: 1823-1830. Kim JH, Won HJ, Shin YM. Radiofrequency ablation for the treatment of primary intrahepatic cholangiocarcinoma. Am J Roentgenol 2011; 196: 205-209. Nakagawa T, Kamiyama T, Kurauchi N. Number of lymph node metastases is a significant prognostic factor in intrahepatic cholangiocarcinoma. World J Surg 2005; 29: 728-733. Peporte ARJ, Sommer WH, Nikolaou K. Imaging features of intrahepatic cholangiocarcinoma in Gd-EOB-DTPA-enhanced MRI. Eur J Radiol 2013; 82: 101-106. Camacho JC, Kokabi N, Xing M. Modified response evaluation criteria in solid tumors and European Association for The Study of the Liver criteria using delayed-phase imaging at an early time point predict survival in patients with unresectable intrahepatic cholangiocarcinoma following yttrium-90 radioembolization. J Vasc Interv Radiol 2014; 25: 256-265. Yamamoto Y, Turkoglu MA, Aramaki T. Vascularity of intrahepatic cholangiocarcinoma on computed tomography is predictive of lymph node metastasis. Ann Surg Oncol 2016; 23: 485-493. Obama K, Ura K, Li M, Katagiri T, Tsunoda T, Nomura A, Satoh S, Nakamura Y, Furukawa Y. Genome-wide analysis of gene expression in human intrahepatic cholangiocarcinoma. Hepatology 2005; 41: 1339-1348. Uenishi T, Yamazaki O, Tanaka H. Serum cytokeratin 19 fragment (CYFRA21-1) as a prognostic factor in intrahepatic cholangiocarcinoma. Ann Surg Oncol 2008; 15: 583-589. Borger DR, Goyal L, Yau T. Circulating oncometabolite 2-hydroxyglutarate is a potential surrogate biomarker in patients with isocitrate dehydrogenase-mutant intrahepatic cholangiocarcinoma. Clin Cancer Res 2014; 20: 1884-1890.
de Jong MC, Nathan H, Sotiropoulos GC. Intrahepatic cholangiocarcinoma: an international multi-institutional analysis of prognostic factors and lymph node assessment. J Clin Oncol 2011; 29: 3140-3145. Uenishi T, Kubo S, Yamazaki O. Indications for surgical treatment of intrahepatic cholangiocarcinoma with lymph node metastases. J Hep-biliary-Pancr Surg 2008; 15: 417-422. Alvarez S, Anorbe E, Alcorta P. Role of sonography in the diagnosis of axillary lymph node metastases in breast cancer: a systematic review. Am J Roentgenol 2006; 186: 1342-1348. Harisinghani MG, Barentsz J, Hahn PF, Deserno WM, Tabatabaei S, van de Kaa CH, de la Rosette J, Weissleder R. Noninvasive detection of clinically occult lymph-node metastases in prostate cancer. N Engl J Med 2003; 348: 2491-2499. Rockall AG, Sohaib SA, Harisinghani MG. Diagnostic performance of nanoparticle-enhanced magnetic resonance imaging in the diagnosis of lymph node metastases in patients with endometrial and cervical cancer. J Clin Oncol 2005; 23: 2813-2821. Seo S, Hatano E, Higashi T. Fluorine-18 fluorodeoxyglucose positron emission tomography predicts lymph node metastasis, P-glycoprotein expression, and recurrence after resection in mass-forming intrahepatic cholangiocarcinoma. Surgery 2008; 143: 769-777. Patel AH, Harnois DM, Klee GG. The utility of CA 19-9 in the diagnoses of cholangiocarcinoma in patients without primary sclerosing cholangitis. Am J Gastroenterol 2000; 95: 204-207.